According to Guo’s research 55 out of 94 Common Core Math Standards from Grades K to 3 are almost naturally connected to go. “Teachers design many classroom activities. Sometimes they have to design several activities to meet the requirement of only one standard. For one game to cover almost 60% of core standards in the early elementary math curriculum is impressive,” says Guo. “Meanwhile, students learn math without even noticing it. 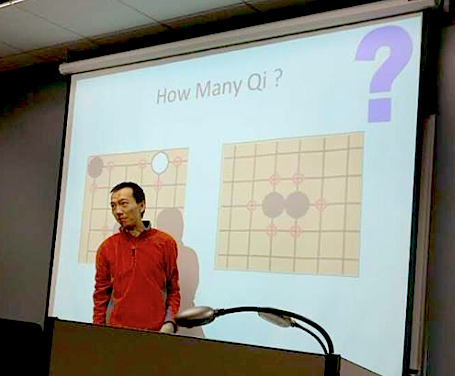 Acquisition of math happens naturally as you play go. That’s the beauty of game-based learning. Most of these teachers don’t know go, so I introduce it as an educational game, which removes the pressure for competition. Once they start to play, they are able to experience the subtle ways fundamental math skills are at work, and identify many learning opportunities embedded in the game.” For further reading see Northwestern University Exploring Go and Math. (E-J 1/31/17 ) -Paul Barchilon, E-J Youth Editor. Photo: Guo presenting at NCE in Chicago.